We had such fun in the chat room yesterday for the UStamp with Dawn and Friends Big Shot Roundup event. Kris Sobolik was hosting the chat and we talked about all sorts of things - Artisan contest, upcoming Convention, cutting SVG files with an eclips, the weather in North Dakota and New Zealand - all good stuff! Tonight I will be hosting a chat for members of the event, so be sure to stop by at 9:30 EST. There are opportunities for prizes! Just sayin'! You can still register and have access to all the projects that have been posted so far plus all the ones coming. A new project is posted every 12 hours along with full supply lists and downloadable PDF tutorials. (My projects also include private video tutorials) For example, Fran Sabad's awesome Pop 'n Cuts project went live today. The event is open to anyone, demonstrators or just crafters who love Stampin' Up! products. (Like me!) There is even a Gallery where you are encouraged to post your own versions of the Designer Projects. I posted my first project the other day and thought that in preparation for my chat session tonight I would prove just how easy it is to reproduce the Floating Framelits card in another color. For this card I cut the Pop 'n Cuts Base Die from a clear window sheet and constructed the Floating Framelits from it. This allowed the outer portions of the card to "disappear" and give the illusion of suspended objects. When the card is closed the dress lines up with the dress form, but then when the card is opened you discover that they are on two different layers. Pretty nifty, huh? I am honored to be invited once again to be a guest designer for the current UStamp event: Big Shot Roundup featuring projects made with Stampin' Up! products. 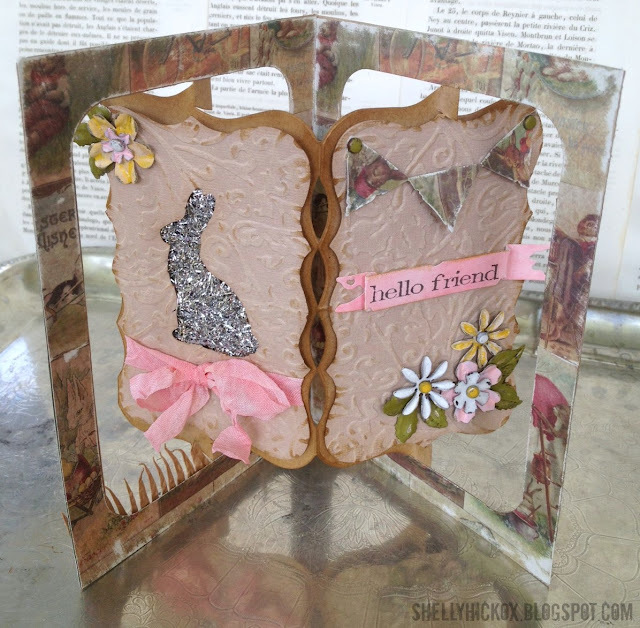 Every die and folder that is currently available from Stampin' Up! will be featured in at least one project by the amazing design team. This is my first project, using the Stampin' Up! Exclusive Card Base for Pop 'n Cuts along with the Dress Up Framelits and Labels Framelits to create a fun interactive card. You can still register for this event, which is going on now. A new project is posted every 12 hours along with downloadable supply list and instruction sheets. For my projects I also do a private video tutorial, accessible on the site for members of the event. I'm hosting a chat on Thursday night. The chats, gallery, prize-winning potential, contests . . . it's a fun place to be! Come on over! Celebrating belated birthdays (it's the latest trend) continues today with a card for Kelly Booth's March 17th birthday! Yesterday I pulled out all sorts of grungy stuff to make a Steampunk Door Birthday Card for Shelly Hickox and naturally none of the supplies had been put away. While starting to store the Tim Holtz Pediments die in my Bigz drawer I got the sudden idea that a pediment would look fabulous on the Accordion Album die! (Pssst - the Accordion Album is back in stock but going fast at Scrapbook.com HERE) It worked out perfectly with another idea I'd been meaning to try - cutting the album out of a clear material. I used Bazzill Plastic Paper for the album. I folded the tabs back and forth several times before assembly to loosen them. The patterned paper is Bo Bunny's Prairie Chic. When the card is closed, the Happy Birthday stamp (Stampin' Up! - stamped with white paint and colored on the back with alcohol ink) has a blue background, which is actually the paper on the back side of Page 2. Clear albums are so fun! You can see, for example, all the white rub-ons (stash item, very old) through the outer frames no matter which layer they are actually on. The patterned papers were cut using the Bigz Frame & Label, Bracket die, which perfectly coordinates with the Accordion Album. To create the circle cut-out I used the Star & Circle Movers & Shapers set. When the circle of that set is cut, it also cuts a scalloped circle at the same time. I turned the scalloped circle into a flower by cutting between each scallop toward the center and then pinching all the petals. I will write a personal greeting on the blue paper before mailing. The bird is a stamp from the same Bo Bunny collection, stamped, colored with Copics, and fussy-cut. The paint color for the edges of the clear album and the pediments is Tim Holtz Distress Paint; Broken China. I cut the pediments from wood-colored cardstock, then covered with paint, dried and sanded. Who will get my next belated card? I'm thinking maybe my Mom . . .
Did you hear about how belated birthday wishes are all the rage now? Apparently wishing someone Happy Birthday with a handmade card on their actual birthday is soooo 2012. Once a birthday is well past, THAT'S when it's time to celebrate! So today we're celebrating the March 15th birthday of my friend Shelly Hickox. Shelly is such an amazing designer and is especially fond of steampunk, so I decided to dig out all manner of paints and stains and metals and such and do my best to make her proud with a Steampunk Door Birthday Card. 1. Paint the item a base color. 2. Use Distress Black Paint over the top. 3. Freak out because it's way too dark. 4. Spritz with water and blot with a rag. 5. Use Distress White Paint over the top. 6. Decide it's too light. 7. Spritz with water and blot with a rag. 8. Dry it with a heat gun. 9. What would happen if I sand this? 10. Don't I have some Vintage Photo Distress Stain somewhere? 11. Did I try spritzing/blotting/sanding/blasting with a heat gun? How about another round of that? But experimentation can yield some cool results, so there's that. The fleur-de-lis is a piece of confetti. For reals, yo. I just glued it on there with some Glossy Accents, then put Glossy Accents on top to make it shiny. I shouldn't use Glossy Accents because I am (a) impatient and (b) a messy crafter. It doesn't matter how far away I put the item to dry, I will inevitably put my hand or a tool or something else down on top of it while it's still wet, thus wrecking the gloss. After wrecking the gloss I did some combination of Steps 1-12 above and suddenly it looked kind of old and weathered and non-confetti-ish. Bonus! Speaking of Bonuses, how perfectly does the new Tim Holtz Pediments die work over the top of my Bigz Door Die? Perfection!!!! I mixed old metals from my stash (hinges, arrow, 1/16" eyelets) with Tim Holtz metals (gears, knob) to create the Steampunk look on the door. For the doorknob plate I stamped a Lost Coast Designs stamp onto shrink plastic and shrunk it. I've found that if you're using actual metal hinges on the door (not decorative, but functional) then it's best to just cut the door at the fold so that only the hinges are used for opening and closing. Otherwise it can be tricky to get the hinges in exactly the right spot to work in conjunction with the crease. If you were at all worried that there was nothing popping up on this card I say pshaw! Do you even know me? I made a very simple box pop-up from a strip of transparency and added the 3D Balloon from the Celebrate Sizzlits Set. I also used the label from that set for the greeting, which is a Stampin' Up! stamp. A couple of final notes - I found a pre-made clock post in a bag of Farmhouse embellishments so it saved me making my own. I also decided the upper left corner of the card was in need of something so I stenciled Shelly's name. It's meant to look somewhat graffiti-esque. The brick is a Tim Holtz Texture Fade, heavier on Vintage Photo and Sanding in the 12-step process. I stamped the rulers to fill the rest of the space. Because I am a giver (I give!) I plan to actually mail this card to Shelly, after using it here on my blog and posting it over on the Inspiration Emporium "Add a Little P.O.P." challenge. Now THAT'S friendship! Ha ha. Accordion Albums are shipping out to stores! Scrapbook.com just got them back in. Click on either die above to go to Scrapbook.com and order. I got a fun piece of Royal Mail from my friend Helen Cryer this week that is the perfect illustration of these two dies in action! The Accordion Album die is cut from blue cardstock and the patterned paper decorations (outer frames, inner labels) are cut with the Frame & Label, Bracket die. Thanks Helen! What a fun mail day! Some of you may have been wondering "Did she get eaten by an alligator in Louisiana?" It really has been an atrocious amount of time since my last post. I plead Disney! On March 6th I boarded Bus #4 in the 5-bus caravan carrying 250 maroon-clad band kids and chaperones to Orlando to march in a Disney parade. On March 5th I sat in the mandatory chaperones meeting at the high school and listened to how the trip would work and what our duties would be. I leaned over to another parent (Vanessa, later nicknamed "Giggles" in our chaperone gang because of her infectious laughing as she rode Space Mountain) and said "I'm a little frightened" to which Giggles replied "I'm petrified!" But we had no reason to be. The marching band is comprised of the most awesome kids on the planet. These kids were responsible, respectful, talented, sweet and full of fun. On Saturday, March 9, they marched through Disneyworld playing a series of Texas-themed songs to a huge crowd of cheering tourists and parents. The rest of the days were spent exploring the theme parks. We hit Universal Studios, Epcot, Hollywood Studios and Magic Kingdom. One of our duties as chaperones was to take one 3-hour shift (mine was 3 am to 6 am Friday night) to patrol the buildings and make sure kids did not leave their rooms. Once all four kids were in each room, the chaperones would tape the doors closed with blue painters tape so it would be evident to the patrols if a door had been opened. So it came to pass that at 3:30 am I was staring at a broken piece of tape lamenting that I was going to be the one chaperone who had to pound on a door and perform a "bust". I went in search of the other parent on duty, Rick, and together we pounded on the door and woke up the sleepy students inside. The door was opened by a groggy girl. ME: Is everyone in there? Your tape has been broken. GIRL: Yes, we're all here. ME: I must come in and verify. So I went in, counted three sleeping girls plus the groggy one at the door. ME: OK. You're all here. Why was your tape broken? GIRL: I think it was from when Alicia came back from the hospital. ME: (confused) Oh. OK. Well I'm taping you back in. Good night. Rick and I discussed how we were unaware of a kid going to the hospital. I snapped a picture of the room number so I could look up which chaperone was in charge of the room from my master list. The next morning, as I was telling the story to my roommate, Leigh Ann, and consulting my master list, I couldn't find the room number on our master list. Even stranger, I couldn't find any girls named Alicia on the list either. ME: Leigh Ann, will you find this room number on the list? I can't find it. And do you know any students named Alicia? LA: No.... hey....are you sure it was our band? And that's when it hit us. Obviously there was another school trip with kids in the same building and that school was using, coincidentally, blue painters tape on their doors! I chaperoned another school's room! We laughed and laughed and laughed about that one. I didn't spend much time with Emma, actually. She was hanging out with her friend Erin and I was not on her bus nor her chaperone. Still, I would occasionally run into her and she was all smiles! Here is a shot of the chaperones, directors and our school principal, who made the trip to support the band. How cool is that?! I made such great friends on this trip. What a fabulous group of parents! We arrived back in Katy, exhausted, on Tuesday morning. Unfortunately by Tuesday night I was ravaged with a terrible cold. I spent Wednesday on the couch moaning. By Thursday I could tell that it was probably a sinus infection and went to the Dr. for some antibiotics. Despite the antibiotics I am slow to recover, although I do think I am on the road, finally. In any case, the kids are back in school and it's time to get crafty!